And I don’t even speak or write Punjabi. So, one of my friends at the San Jose Punjabi Mela Committee, Jaskaran S. Sahota of Bridgepoint Entertainment LLC, a former professional field hockey player slash independent filmmaker slash bhangra music video director slash software engineer in Silicon Valley, asked me for assistance in finding advertisers for his made-for-DVD movie, shot with high definition cameras. 15-second and 30-second broadcast commercial spots are available for placement inside the DVD. Jas tested the story line with a live Punjabi Comedy show in Milpitas, California this past February — and he got rave reviews and a sold-out house! Thus, 60% of this DVD movie was inspired by this theater project. April 27, 2007: Tina Roth, one of my internet networking friends, shared Josie Agbayani’s PINOY DINING GUIDE with us recently. I asked Tina where Josie got the dining guide but she didn’t know the source. So, whoever you are, thank you for sharing this with us. This might be incomplete — so don’t kill the messenger! Always call up the restaurant before you make eating plans. July 2007: Here’s another eclectic listing! A potpourri of “just as good as home cooking” and upscale restaurants serving elegant and fusion-infused versions of Filipino food that were featured by Contra Costa Times in the Food and Wine section, July 18, 2007 edition. I’ve also included some of the recipes found in the article. Thank you to Satur Respicio, Jr. for sharing the article with the filamvoters yahoo group. January 2008: Although I’ve expanded the Pinoy Dining Guide to include Filipino-Fusion Cuisine, do let me know if some of the places found here have moved or closed shop. I haven’t been to all of them so if you’re not a blogger but would like to feature your food review here, please contact me. You’ll know when I update the list because I do put in the date when I add more places to go to. Announcements and comments from my friends. - Alex Viray: About the expansion of Kenkoy’s with a new branch close to the ballpark in San Francisco. Well, it looks like they took over Carmen’s at Pier 40.It’s now Carmen’s Adobo Joint. - Jose Pecho: About Alido’s. I looked them up on the internet. - Francesca Regala, yoga teacher: A Noe Valley resident, Francesca reminded me that Palencia is found in Noe and 17th Streets in San Francisco. If you’re looking for a San Francisco location, this is it! - Lily Ann Villaraza: She reminded me about Mitchell’s Ice-Cream, a San Francisco landmark. - Mona Lisa Yuchengco, Founding Publisher of Filipinas Magazine and informed me that Chef Anna Bautista of Nua Restaurant has left for the Philippines. - Jonathan Sabolboro: He yahoo IM’d me that he had lunch at the Clamhouse in San Mateo, owned by Francis Espiritu. - Manuel Ramirez, regional distributor: Chill! Berry Frozen Yogurt makes its debut in San Jose, CA at the Lollicup Tea Zone. A free coupon, valued at $1.00 is available until October 2008. Click here to get your coupon. - Chito Desuasido announced the opening of Alimango Restaurant in San Mateo, CA. Filipinas Magazine, in its August 2007 edition, featured some of our Filipino chefs who are making waves in the American culinary scene. Pages 38 to 41. For example, Chef Anna Bautista cooks her seasonal Mediterranean cuisine offerings at Nua Restaurant, 550 Green Street, San Francisco, CA (yes, North Beach!). Dinner is from 6pm-11pm, Tuesdays through Sundays. Call (415) 433-4000 for reservations. www.nuasf.com. Thank you to Marylou “Dada” Tan for her e-mails to us about her food reviews. 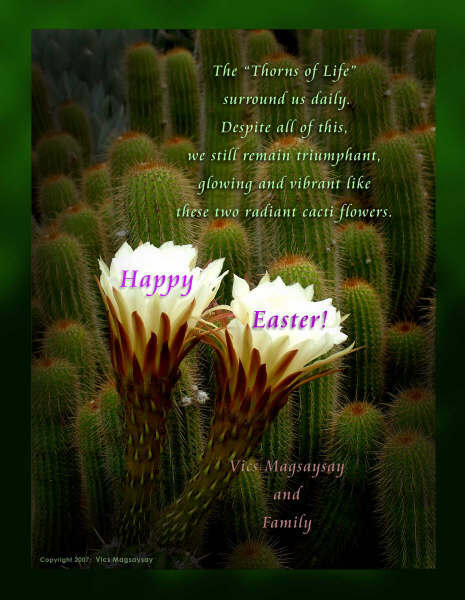 I received this beautiful greeting for the Easter holidays, my season for reflection and contemplation. Thank you to Vics and his family. Happy Easter! If you want to view (and buy!) any of Vics Magsaysay’s award-winning photographs, you can reach him at www.yessy.com/vicsmagsaysay. What happens when two political advocates for education can’t see eye to eye? If you were a public relations practitioner who is interested in bringing attention to your community cause, what would you do in this scenario? Check out the events that happened within a few daysâ€™ span. Do your homework. Find out what is really happening by conducting your own investigation. An informal survey, too, if necessary. Find ways to establish common ground — or negotiate. If appropriate, publish your investigative results. One last thing: Communicate to each other. Smile even if it hurts! Here is the latest from my world of announcements and events. I’ve been sending out my personalized e-mails since 1996. Let me know what you think! There are a lot of events going on in our part of the West Coast. They’re all at www.RadiantView.com ; click on THE FILIPINO CALENDAR: EVENTS & ANNOUNCEMENTS. - The “Carry the Vision” Community NonViolence Conference & Youth Leadership Summit this Saturday, April 21, 2007 at Evergreen Valley College, San Jose, CA. is ready to bring all peacemakers in one venue. We know that Yolanda King will be one of the honored guests & speakers. If you are interested in interviewing any of the featured speakers, please contact Bea Baechle (see information below). - The Filipinas Magazine Achievement Awards’ preparations for its 10th anniversary of the awards is in full swing! The event will be held on Sunday, June 3, 2007 at 4:00 to 9:00 p.m. at the South San Francisco Conference Center. It starts with a Barrio Fiesta Reception (lots of food and networking opportunities!) — and at 6:00 p.m., everyone moves to the next hall for the Awards event. For tickets (they’re $30 each), contact Francis Zamora at [email protected] or call (650) 985-2530. Sponsorship and advertising opportunities are still available — but do hurry! Contact me at [email protected] if you’re interested. Check out the online edition at www.FilipinasMag.com . As always, I can take care of your subscriptions, too! - The 2007 San Jose Punjabi Mela will be held on Sunday, June 24, 2007 at the Evergreen Valley College campus grounds from 9:00 a.m. to 7:00 p.m. This will be the 2nd year that I’m volunteering with the San Jose Punjabi Mela Committee. This year’s Chairperson is Dr. Kulwant Gill. I’m also looking for sponsorships and booth vendors. If your organization wants to reach out to the influential and affluential Indo-American population of Silicon Valley, please e-mail me at [email protected] Updates can be found at www.myspace.com/SanJosePunjabiMela.